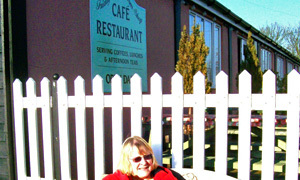 Friday Street Farm Cafe is just off the A12 in the Aldeburgh direction. There is plenty of parking and if you are lucky you can park right alongside the cafe. It's a popular place, serving good wholesome food at very reasonable prices. There is usually a choice of 4 or 5 main courses although we have found that the popular ones (steak and kidney pie, for example) tend to sell out quite quickly. We did book recently but whether you can also stipulate what you'd like to eat I'm not sure, but fortunately the steak and kidney was still available! A ramp leads up to a nice bright and light building with tables alongside the windows if you're lucky, and tables outside on a raised platform arrangement for when the weather is above freezing. There is the odd daily newspaper to read while waiting although the waiting time is normally quite short, and the good old Suffolk magazine is for sale. So this is the place for non-adventurous food although I did notice duck breast with cherry sauce was on the menu last week if that counts! So all in all nothing much on the downside EXCEPT the heavyweight chairs which need a few weeks of lifting weights to be able to move them, they are that solid. Otherwise 9 out of ten on the Mrs B scale. Nobody famous passing by but of course with Aldeburgh a few miles away you never know. Also the farm shop is well worth a look either before the steak and kidney or after!